Three American Indian painters will have their award-winning art on display at Exhibit C in Bricktown from March 1 through June 30, 2018. The show, titled “Transitions,” will feature the unique styles of artists Yatika Starr Fields, Hoka Skenadore, and Josh Johnico. 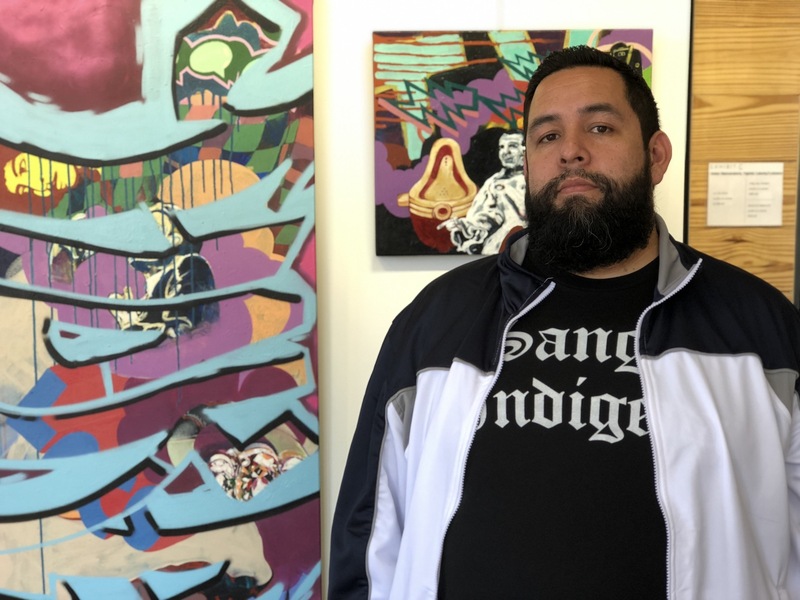 In this Artist Statement Minute, Hoka Skenadore talks about his work at Exhibit C.
Each artist has a background in graffiti and street art and has recently transitioned their careers to focus on fine art. Through their creations, they celebrate Native American culture and test the boundaries of traditional art to make it their own. [pullquote-right]”Displaying the talents of these street artists, who turned to fine art, is one way Exhibit C provides a Native American experience to visitors and locals alike.”[/pullquote-right]“Displaying the talents of these street artists, who turned to fine art, is one way Exhibit C provides a Native American experience to visitors and locals alike,” said Paige Williams Shepherd, director of corporate development and tourism for the Chickasaw Nation. For the last decade, Fields lived on the east coast, as well as in Seattle, where the energy of urban life inspired and fed the creative force behind his artwork. Now, Fields lives and works in Tulsa in conjunction with the Tulsa Artist Fellowship. Hoka Skenadore said he grew up in a home where he learned to appreciate traditional Native American art alongside fine art. On his own, he embraced the D.I.Y. ethos of punk rock and hip-hop culture and painted graffiti art. Skenadore currently lives in Norman and is building off his bachelor of fine arts from the Institute of American Indian Arts in Santa Fe, New Mexico, to pursue a master’s degree from the University of Oklahoma. Josh Johnico brings a unique take on contemporary art, painting mostly on canvas. Although Johnico has been creative for as long as he can remember, he said taking art classes at a community college restarted his passion for painting and Native art. Through his paintings, Johnico said he works to give concepts new life, sometimes painting his own version of old black and white photos. “I look at Native art as a way to keep Native American history alive, while presenting the culture in a new way,” Johnico said. The Exhibit C art gallery and cultural experience is located in Oklahoma City’s Bricktown. Exhibit C’s art gallery displays works of several artists from the Chickasaw and southeastern tribes and continues the vision of raising awareness of the many cultural and entertainment experiences in Oklahoma set forth by Chickasaw Nation Governor, Bill Anoatubby. Exhibit C is open daily from 11 a.m. until 8 p.m. at 1 E. Sheridan, Bricktown. All items located in the Exhibit C art gallery and retail space are for purchase.